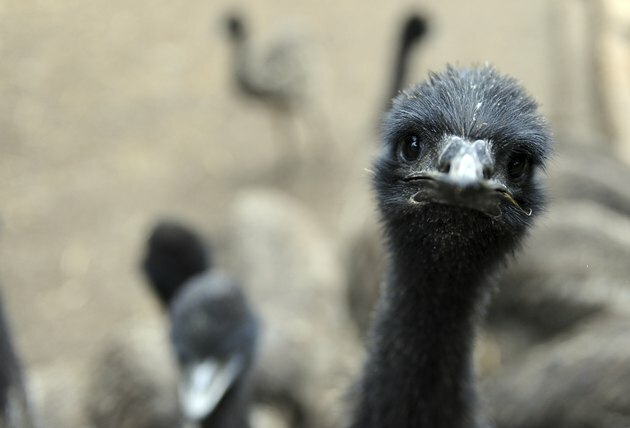 Emu oil is prized as an odorless anti-inflammatory skin supplement. With a creamy consistency, it's readily absorbed through the skin and contains essential and beneficial fatty acids. Emu oil is used as an emollient in cosmetic products and may help reduce the appearance of aging. Emu oil comes from the fat of the bird. When the fat is removed from the bird, it's rinsed and drained to remove excess water. The fat is kept whole and refrigerated, or frozen, immediately after being removed from the carcass of the emu. Improper handling of the fat can lead to contamination with bacteria, making the resulting oil unusable. The rendering process for emu oil varies among manufacturers; a variety of methods exist and may vary based on region or country. exist. Usually some sort of heat is applied and the resulting oil is then washed, dried, filtered and refined to remove impurities. Be sure to select emu oil produced by a registered FDA manufacturer.